It is common knowledge that the Classical Age was followed by many centuries of utter stagnation and decline with virtually nothing happening but wars and famine and the destruction of the priceless ancient monuments. Then, during the Renaissance, the Classical authors reappear from oblivion, Latin and Greek become resurrected as the intelligentsia Esperanto of the Middle Ages, numerous manuscripts reappear from oblivion to be copied, enter wide circulation, and vanish again, never to be found. How preposterous would it be to suggest that there were no Dark Ages to separate the antiquity from the Renaissance – that the “Re-naissance” was in fact the Naissance of the Western European culture as we know it? It does contradict everything that we may ever have learnt about history. However, new methods offered by empirical statistics and developed by Anatoly Fomenko, the Russian mathematician, and his colleagues, provide plenty of evidence to support the theory that the Dark Ages are a phantom. We find lots of spicy morsels in the cauldron of history, and some of them are impossible to digest without soothing explanations that all the contradictions we encounter are to be blamed on the ignorance of the scribes or some such phenomena inherent in the murky past – fancy the statue of Marcus Aurelius lost for several centuries and then found “by accident” on one of the Roman streets, or Senators congregating amongst the ruins of the Capitol due to their being “nostalgic about the great imperial past of the Empire,” or the pagan temples turning Christian at the wink of an eye, with the name of the saint coinciding with the name of the pagan deities that these very temples were consecrated to in the mysterious “days of yore”? 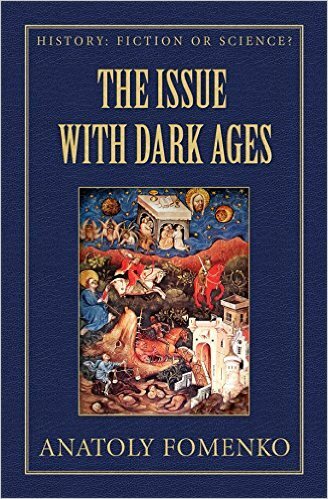 The material of The Issue with Dark Ages book crowns scores of years of meticulous and extensive research performed by the eminent mathematician Anatoly Fomenko and his colleagues. This book is also the next volume in History: Fiction or Science? e-series, the fundamental oeuvre that exposes and expounds the numerous inveracities of the traditional version of history. The e-series History: Fiction or Science? contains data and conclusions that aren’t anything short of revolutionary. The alternatives offered to classical history are stunning, unorthodox to the extent of being labelled heretical by virtually every scholar of history, and daring enough to be considered preposterous at first sight, although this impression never lasts longer than it takes one to read a few pages attentively. The author dissects every historical age and analyses the data from every source imaginable – concensual chronology takes a good beating, and it goes rapidly downhill from there. The culprits of this issue are identified. The Issue with Dark Ages is actually the result of creation in XV-XVII centuries of a mythical Classical Age that never was by misdating mediaeval events by hundreds and thousands of years as very ancient ones.